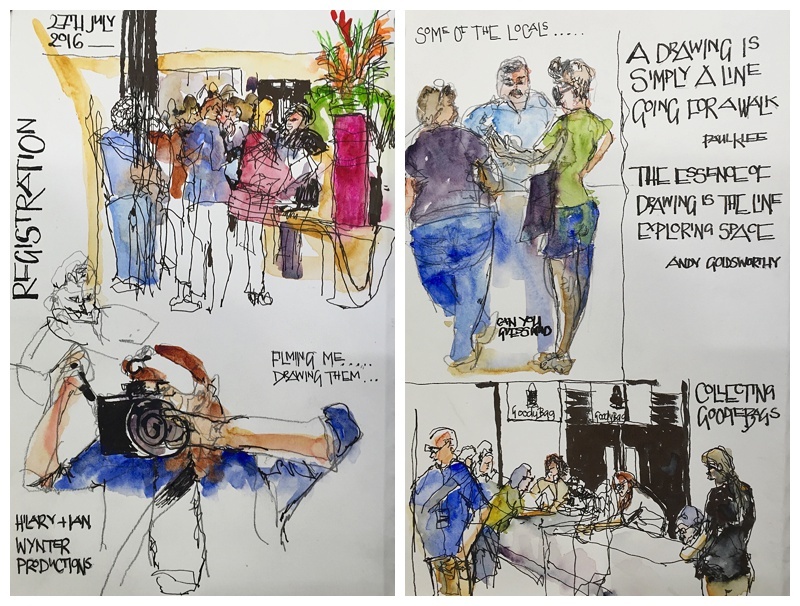 [By Liz Ackerley, Symposium Correspondent Manchester 2016] Today we kicked off the 7th International Urban Sketching symposium here in Manchester in the absence of rain! Registration was off to a flying start this morning with workshop leaders and those going on the morning coach trip eligible to early registration. Then this afternoon, the rest of the delegates were able to register. Despite the worry of the number of people needing to register, those in charge of proceedings did an admirable job of moving quickly through the queues. The goodie bags also went down very well with a whole bunch of great art materials. A couple of people are filming various aspects of the symposium and it was fun to catch up with them by sketching as they were filming! This year there are a number of stalls selling books and art materials. They are going down really well with delegates. 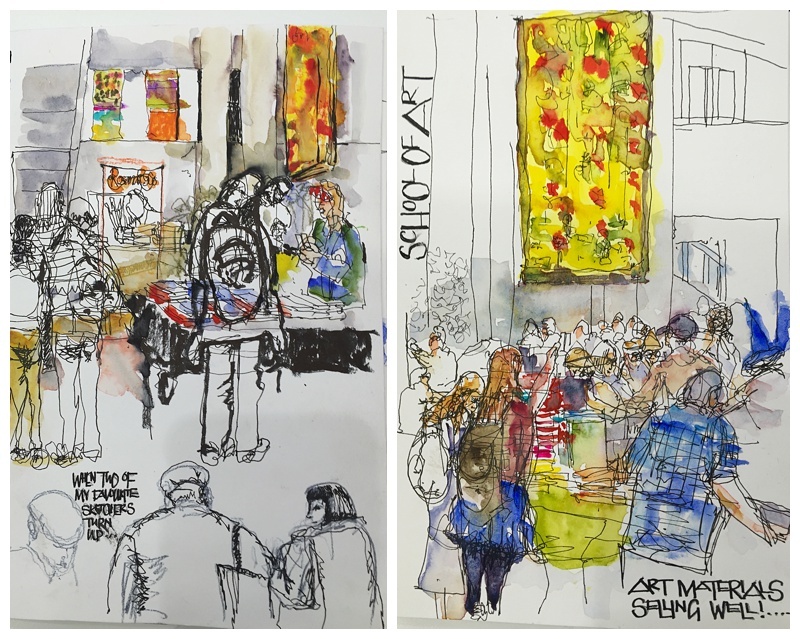 The local art shops Blythes (based in the Northern Quarter) and Turners of Stockport were busy all day it seemed! 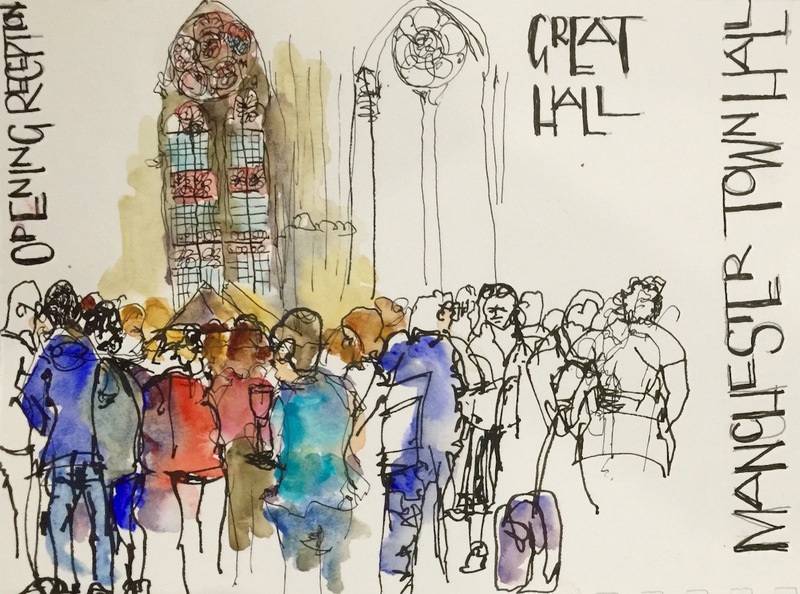 This first day ended with an Opening Reception in the Town Hall. There were speeches by Phil Griffiths, writer and Penny MacBeth from the School of Art at Manchester Metropolitan University (MMU). 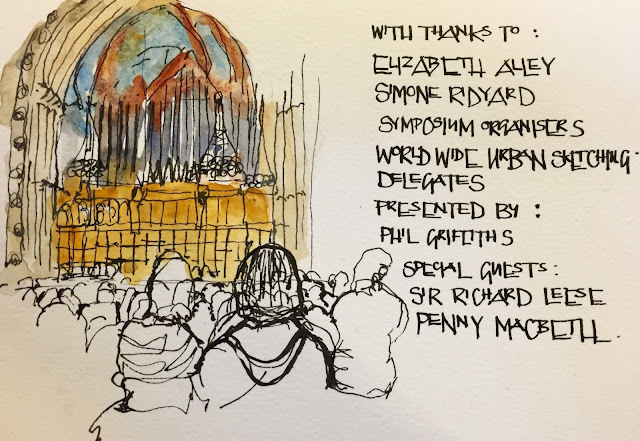 As well as a welcome by the President Of Urban Sketchers, Elizabeth Alley and by the Leader of the Council, Sir Richard Leese. I'm looking forward to tomorrow and the start of the program. Stay tuned for our correspondent blogs on the workshops covered tomorrow.